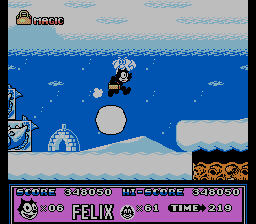 NES Felix the Cat (USA) in 22:29.01 by Randil. This game is about a classic cartoon character, Felix the Cat, who goes on an adventure to save his girlfriend, Kitty, from a mad professor. It's a simple platformer like any Mario game. This is a 24.26 second improvement over Randil's previous run. This is due to several strategy changes, such as using the airplane more often in flying levels and using a different power to fight the final boss. For more details, see the author's comments.